Donor Profile: Virginia isn’t just for TV! We would like to thank Tradex Consulting, parent company of the WineCompass Blog and VirginiaWineTV for their support of the WBC Scholarship! We couldn’t have done it without you, please give them a thank you at @winecompass and @Vawinetv! I still have to finish all of my individual thank yous for all of the support and great bloggers we’re getting to Virginia. But, with 14 short days left until the 4th Annual Wine Bloggers Conference commences in Charlottesville, I just wanted to make sure that we shared all the good news! This year, we have fourteen blogger recipiants. This is a new record! The Scholarship is in its third year, and I’m seeing the number 20 for next year! Our corporate sponsors, who have our undying gratitute and support! Congrats to our bloggers and thank you to our donors, and our committee! Please take a moment to reach out to everyone and say hey. If you’re in Virginia, come by and see me – I have cool namebag swag! Each badge ribbon is $2, 3 for $5, and all proceeds go to support the scholarship next year. Spoiler Alert: Scholarship Redux….well, kind of. 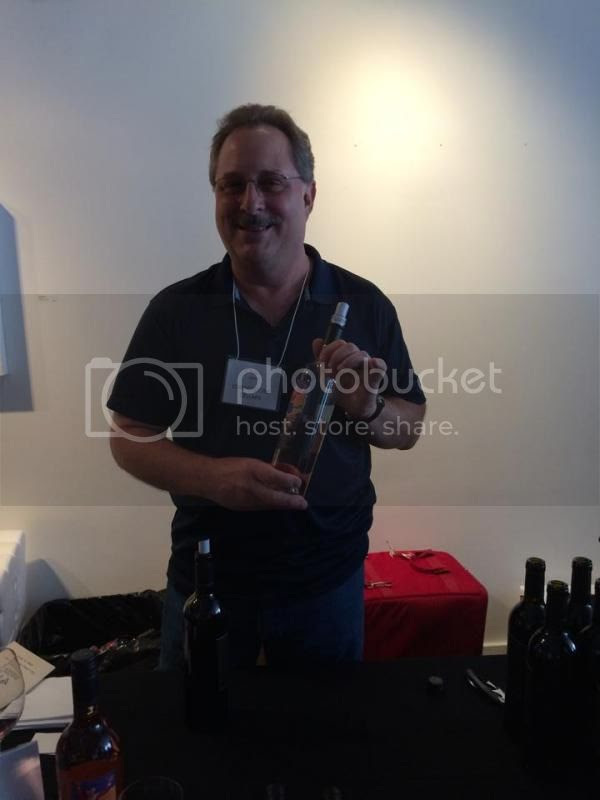 Scott Wadlow, the publisher of “The Vino File” brings a wonderful voice of character to the wine blogosphere. Of course, Scott writes interesting wine reviews on a range of varietals and types of wines. He uses a well defined point scoring system, likes to educate his readers and, of course, be educated by them and also appreciates an interaction on a variety of mediums including on twitter where he answers to @thevinofile. ..and while Scott likes to engage his readers for a variety of reasons the one he’s most excited about is plain old FUN. That’s right. Nothing complicated, no creative adjectives or $10 words. Fun. There’s great transparency in the simple things. Nothing to get in the way. Nothing to confuse. Read some reviews, drink some wine, engage in a discussion or two, learn a bit, teach a bit. Simple. FUN! I think what Scott is getting at is, for him, it’s not about the technical geekdom of a wine but rather about the experiences that wine brings to enhancing life. It’s quite nice to see that enhancing life is a big part of his “Raison d’être“….and now to the REDUX part. Scott was a WBC Scholarship recipient in 2010. I met him in Walla Walla, WA for the first time and really enjoyed his take on blogging. This year, he returns the favor so that someone else may enjoy the experience that he did, may meet new friends and colleagues and might just learn how to have some fun! Vintank envisions bringing wine closer to technology. To do this, they are working hard every day to build a framework where wine and technology collide. Developing new strategies and ideas, these experienced wineaux and tech geeks analyze, research, and form strategic evaluations to help solve complex problems. Vintank has been supportive of the WBC Scholarship over our lifetime, and we thank them for their continued belief in bloggers and the Wine Bloggers Conference! Through their support and promotion of wine bloggers individually and their promotional services given to the finalists in some top blogger contest (such as the Murphy Goode social media guru run a couple of years ago), Vintank gets things done. GIve them a shout at @vintank and check out what they do. It’s pretty cool! Plus they know how to throw a party. Celebrating their 30th vintage, Hahn Family Wines and Nicky and Gaby Hahn now harvest more than 1000 acres of vines in the Monterey County of California with nearly 50% in the Santa Lucia Highlands AVA. Comprising 9 brands including the famous Cycles Gladiator and the premium, estate bottled Lucienne Vineyards, Hahn Family Wines produces and distributes a wide range of wines for every palate and price point. We’re extremely grateful for the Hahn Family’s continued support of the blogger scholarship fund as well as their commitment and support to bloggers across the wine community. They actively appreciate and support the work bloggers do with access to events such as their “Spring Fling” and other unique visit opportunities to their estate. Hahn sets an excellent example of how to engage with bloggers! Many Thanks! Many thanks to the gang at Soirèe for their generosity in their 2nd year supporting the WBC Scholarship Fund. Soirèe is a bottle-top wine aerator that fits securely into any whine bottle allowing you to pour directly through the Soirèe and actively infuse your wine with oxygen. Using the Soirèe to aerate your wine, you will notice the subtleties and character of the wine emerge immediately upon entering your glass. The Soirèe team has became involved with the WBC at the 2009 edition where we first met them and were introduced to their bottle top decanter. They do a great job supporting bloggers and the local wine community. We’re big advocates of the Soirèe and highly recommend using it when you’d like to actively decant a nice bottle. Soirèe compliments both red and white wine and is available at your local wine shop, at retailers such as Whole Foods, Target & more and of course online at winesoiree.com.